I know Valentine's Day gets a lot of slack for being a Hallmark holiday, but honestly- I love celebrating anything! Chuck and I always celebrated at a local restaurant with a nice dinner out, but then that place closed so we moved to another local spot. That one then changed and actually now moved closer to us, so we are trying to plan a weekend date to visit kid-free. 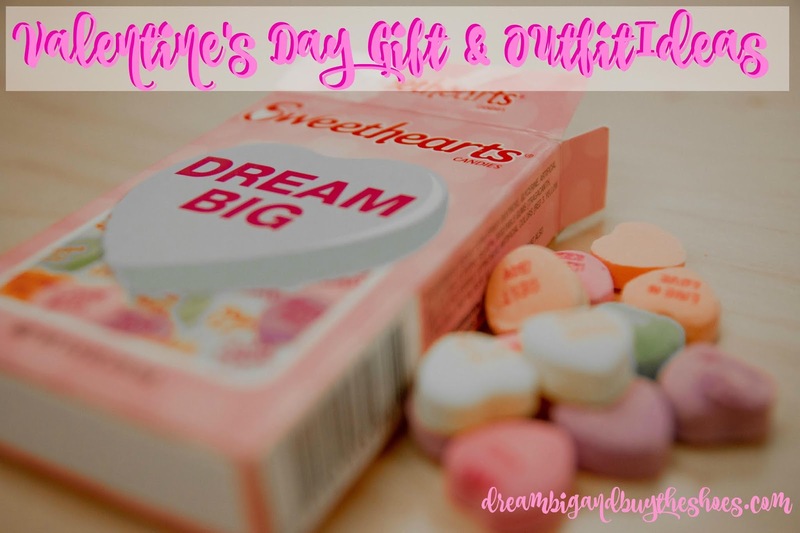 We always treat the kids to a little something, so today I'm sharing some gift ideas and some date night inspiration for lovers day ;) There are affiliate links in this post. Also- if you didn't have a chance to check out Friday's post I am giving away a $15 Target gift card and hoping you can help me out to take part in a quick reader survey for Dream Big and Buy the Shoes! I love the Portofino shirts from Express. They are ultra classy and look good with a pair of dress pants, or with a cute cardigan and jeans too! This heart print shirt is the cutest I've seen yet! These heart earrings are a perfect pop of fun if you're looking to keep your outfit simple for the holiday! I love this heart print scarf that subtly adds to any neutral outfit, this one can be worn any day of the year for sure! These heart sweaters come in so many different colors- there's an option for everyone. You don't have to stick to red or pink to show some love. If you're staying in to celebrate, you can cozy up in these heart print pajamas that look ultra comfortable and still- so cute. I know some couples do exchange gifts, and Chuck and I used to- but we decided that a nice evening out was just enough for us to celebrate this holiday. Here's some ideas if you're looking to pick something up for a Valentine's Day gift! I gifted Chuck a cigar humidor last year and he gets a ton of use out if it for storing his cigars effectively. I'm going to get this case and keychain for airpods for Ethan, and remove the fashion puff part of the keychain- he's been wanting a colored case for his. You can't beat the price of this smart gift! Love this charging stand for iPhone, airpods and Apple watch since it's so sleek and can nicely store all of your gear. How cute are these pizza socks in a box?! Such a fun little idea for a silly gift! This slim wallet is perfect for any man-the bulkiness of a normal wallet is a thing of the past. I picked up one of these Crayola mess free art sets for Bella and can't wait to see how she likes it. She recently was coloring at a restaurant for the first time and seemed to love it. This fold out lounger for kids is something they could use anywhere in the house and keeps them comfy. The silicone teether for babies are so helpful and I speak from experience when I say, they seem to work best for when they're in the midst of teething. Bella goes to town on hers! I love good bath toys, and ones that can't get gross inside with water getting stuck in them! These stacking octopus bath toys are so cute and help with motor skills too. Bella has a few of the Gund playsets and they are SO cute. This one for boys or girls is a plush playset sports bag that is absolutely adorable and fun. Just love this "my first purse" and all that comes with it- I can see little toddlers loving dressing up like Mommy with this. Chuck got me a Swell steel insulated water bottle one year and I use it ALL the time. It is so helpful for keeping things cold for a long time- I always take it with me in the Summer to Ethan's soccer games and when we are on the go. It's so useful! I love the Chrissy Tiegen cookbook- not only are there so many great recipes, but she is absolutely hilarious. I've never in my life laughed so much reading a cookbook. The Pop Socket car mount is another useful, everyday gift. Everyone has a Pop Socket these days and I always hook mine on my mount when I'm driving so it's handy if I need it. These Essie gel couture sets are so nice and the polish lasts about a week when I use it. It's so easy to apply and really holds up well. There are so many pretty colors too! This wireless cell phone charger would be so nice for traveling or at your desk to keep all the excess cords out of the way. I'm all about practical gifts, if you couldn't tell. Hope this gives you some good ideas for Valentine's Day. What are you doing to celebrate? Do you buy your significant other gifts for the holiday?